The SCIMITAR Series are 1kVA and 2kVA inverters which are 19” rack-mountable and only 1RU high. They operate from a 12V, 24V or 48VDC source and produce a 115 or 230VAC output. The tightly regulated low distortion 50 or 60Hz sine wave is produced by DSP controlled power circuits using an advanced high frequency, pulsewidth modulation technique which achieves up to 92% efficiency. A built-in Static Transfer Switch allows connection of a utility or other AC power source which can be switched to the load automatically in the event that the inverter switches off. In normal operation these inverters isolate the load from wide voltage swings , transients and noise usually present in the AC utility and which can cause equipment reliability problems. 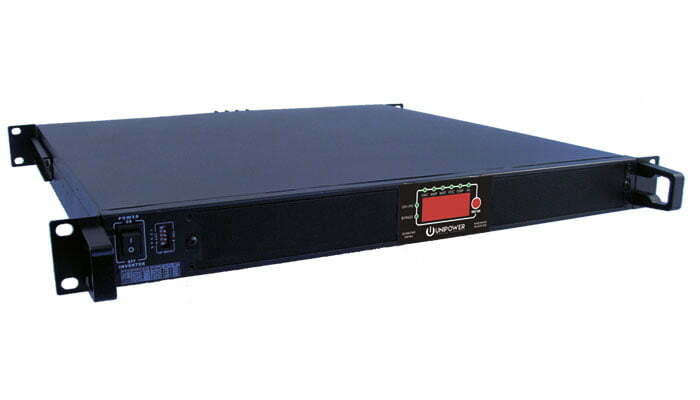 Output voltage and frequency are programmable from the front panel, as well as Baud Rate for the RS232 communications interface which can be used for remote monitoring. 115VAC models are shipped pre-programmed to 60Hz. 230VAC models are shipped pre-programmed to 50Hz. 115VAC models can be programmed to 100, 110, 115 or 120VAC. 230VAC models can be programmed to 200, 220, 230 or 240VAC. 115VAC models have 2 x NEMA 5-15 outlet sockets. 230VAC models have 2 x IEC60320-C13 outlet sockets. If in doubt about load PF (Power Factor) assume that it is 1.0PF. These models are UL Listed, file number E130645. To specify the SNMP option add ‘S’ to the end of the model number, e.g. INV4810R-NS.